An additional grated floor is added to the Tuffway. This allows dirt and moisture to fall to the ground rather than collecting in the floor. This makes for a cleaner environment and also allows for better air flow to keep odors to a minimum. By design, the Tufway interior is built for user comfort. It has a spacious, well ventilated interior to reduce odors due to simple, yet important features. A combination of floor and molded-in wall vents facilitate continuous air flow. The urinal drains down the vent pipe, which prevents unwanted tank odors from venting back into the cabana. The seat is positioned at the furthest point from the urinal, away from odor and user’s direct sight. There is also a convenient door hook to hang a purse or jacket. Together, these features produce a more comfortable, pleasant experience for the end user. 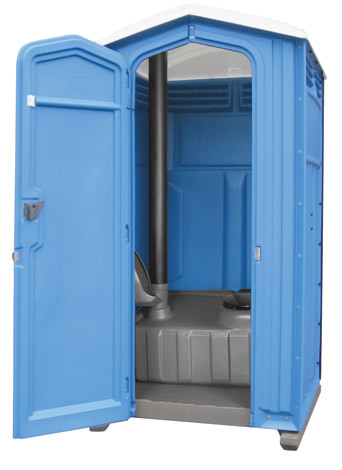 Operationally, the Tufway is a low-maintenance, easy-to-service restroom with a long history of durability. Using fewer parts made from high density polyethylene, the Tufway can withstand impact and abusive handling without cracking or breaking. The features which make the Tufway easy to clean and service are the front sloping tank top, slightly domed floor and smooth, deep sumped tank. Adding slope to the tank and floor surface forces liquids to drain, not puddle, and the sumped tank improves deodorizer coverage and assures quick, complete waste removal. Have a special event or project and need to find out how much it will cost? Get a FREE quote today.